Get my free cookbook as an ebook for your tablet. You don't need a luxury kitchen to prepare gourmet meals at home. My name is Dennis and I live in a mobile home in a trailer park. This is from my kitchen. This recipe comes from my SmoothieTube YouTube channel and it has been the most popular video on that channel. That channel has only 75 subscribers. 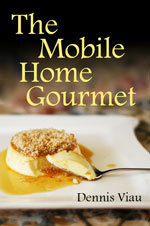 My Mobile Home Gourmet channel currently has more than 28,000; so I thought I'd share the video and recipe with them. It's a delicious smoothie, and it is also an example of why we can't always trust recipes we see in cookbooks. I needed to modify the recipe to make it work. The original was obviously never tested. The following video(s) are on YouTube, but they are currently "unlisted" (hidden); however, you can watch them now by clicking on these links. Click the green View the Video button on the recipe page. These videos will go "Public" in coming weeks. My recipes in the Recipe Archive are in web pages and in PDF format. If you need Adobe PDF Reader (it's free) you can download it using the link below.